Combine all marinade ingredients in a glass dish. To make everything more efficient, mince a bit extra garlic, ginger and cilantro to use for the dipping sauce. Slice chicken breasts into cubes or strips (or leave whole if squeemish/lazy). Marinade chicken for 1 to 12 hours. Preheat broiler or grill to high. Thread chicken on to skewers, or spread out well over baking sheet. Broil 5-10min, or until meat begins to brown, then turn over and repeat for the other side. Optional add-ins: minced garlic, ginger, cilantro, etc. Combine all ingredients in a small bowl. Whisk with a fork until smooth. For a thinner sauce, whisk in a few spoonfuls of water at the very end. This is a classic dish that everybody likes, and is dead simple to make. To have this as a meal, we recommend serving it along side a carb source such as rice or noodles. 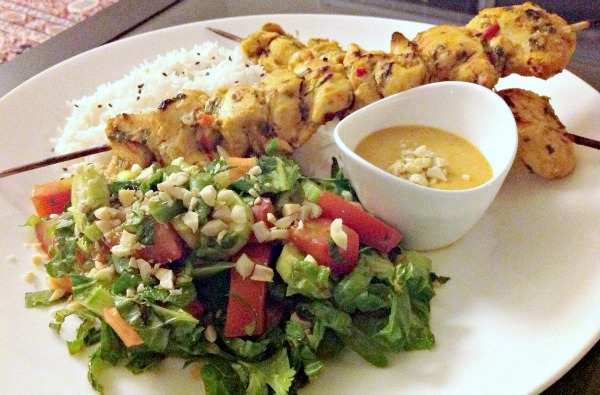 Chicken Satay served with peanut sauce, a small bowl of rice and cucumber salad makes for a delicious and wholesome meal. A lot of your favorite restaurant dishes can fit into a healthy diet with a few simple tweaks and without sacrificing on taste. What would you like to see next in quick, tasty recipes?